When I asked John to help me create a herb garden this year, I had no idea of how much a 10 x 10 plot would yield. Needless to say , I have had a bumper crop of Genovese Basil, and had to do some fast thinking to come up with some other way to use it other than drying it or freezing it. 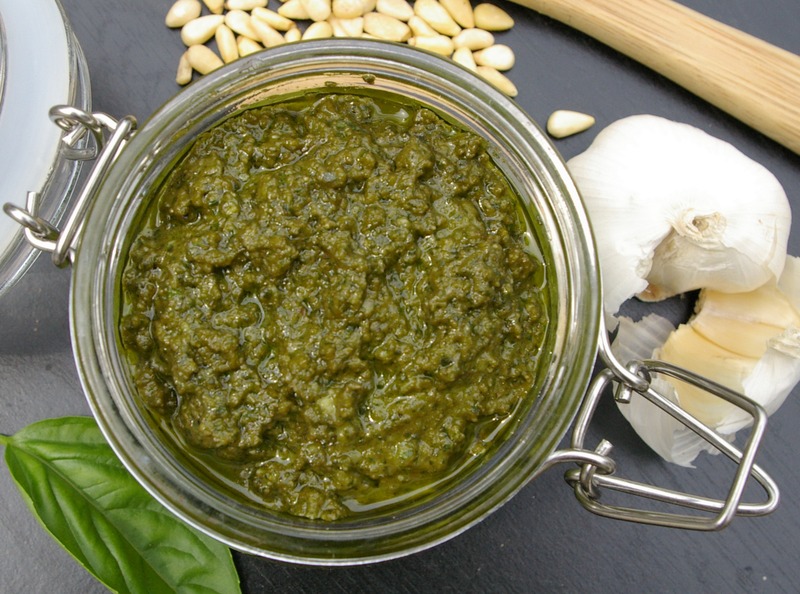 So I decided to make pesto. When you pick the basil make sure to not over pick the plant , this I have learned . If you pick too much off at one time it will not grow back fast enough. It is best picked in the early morning or on a cloudy day, and if you see it starting to go to flower, pinch off the top and do not let it go to flower because the plant will put all of it’s energy into the flowering. The same goes with alot of herbs. I usually go out every couple of days or so and pinch off a few of the largest leaves from each plant. Then I wash it and spin it dry . The salad spinner is a great invention for the modern cook , I can’t believe I only started using one a few years ago . 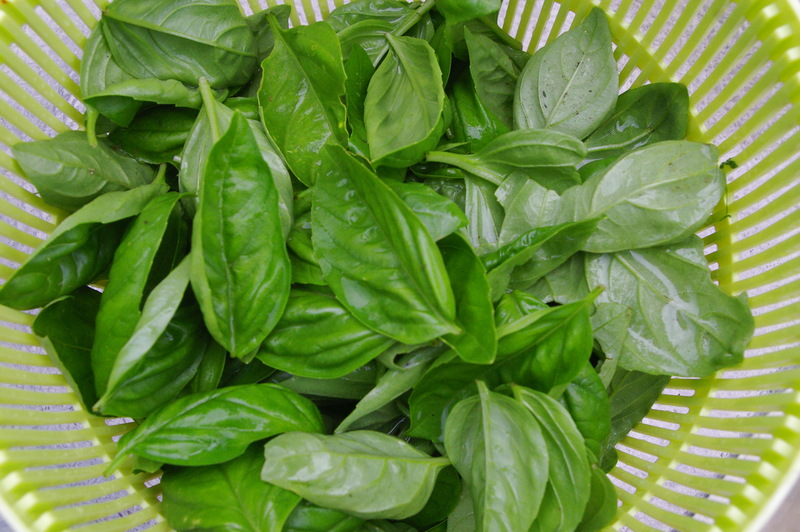 In food processor, combine together basil, Parmesan cheese, pine nuts, salt and pepper. Scrape down the sides with a spatula. With motor running, add 1/3 cup (75 mL) of the oil in thin steady stream. Stir in garlic. Store in refrigerator for 3 days, or freeze in airtight containers with a little oil drizzled on top, or what I like to do is put in a ziplock back and flatten , that way I can break off pieces when I need them . If you want to be more precise put in ice cube trays and freeze into cubes and store in a ziplock bag.